An R-1 powered way freight backs a small set of cars on to the side spur after switching off of the main line in front of the stately Chicago & North Western depot in the heart of downtown Woodruff in northern Wisconsin. 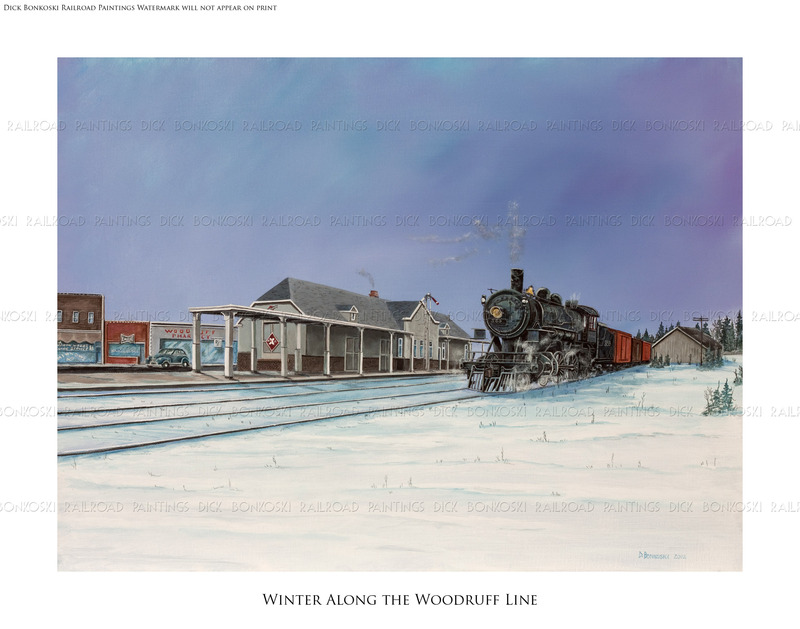 After a leisurely ride down the line from Lac du Flambeau, the crew works the stub ends of local businesses all the way to Rhinelander providing a vital link between the mills, shops and lumber yards and the customer’s depending on their goods. The sidewalks in town are empty for now but as soon as school is out, they will once again bustle with friendly tourists and vacationers who came via rail to the small town each summer to fish the numerous lakes, browse the souvenir shops or sample the local fare in one of the many restaurants. Even former U.S. President, Dwight. D. Eisenhower frequented this area throughout his post-presidency years and his arrival by train often packed the depot platform and parking lot with admirer’s eager to catch a glimpse or snap photo of the former Commander-in-Chief. The Chicago & North Western’s depot was located at the corners of highways 51 and 47, just 2 miles from sister city Minocqua. Not to be out done by the C & NW, Minocqua also had direct rail service offered by competitor, Milwaukee Road. Resort owners and fishing camps that beaconed visitors through the lure of big fish and clear swimming lakes often noted a willingness in their print ads to “meet all trains” so visitors could chose either railroad to get them “Up North”. These trains were referred to as Fisherman’s Specials and were so popular during the summer months and weekends that traffic demands required an increase of train sets from Chicago to the north woods. The Woodruff depot stood until 1977 when it was demolished to make way for more suitable real estate befitting the changing times.